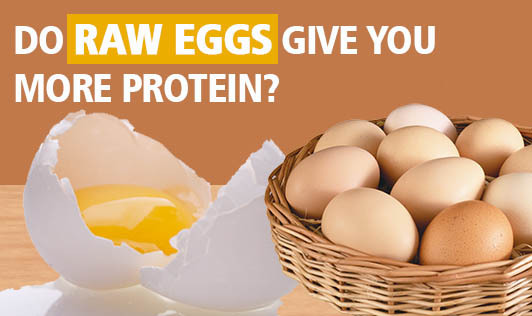 Do raw eggs give you more protein? There are many fitness freaks who think that raw eggs give more protein and help in body building. There are people who gulp down 6-7 raw eggs every day! Do raw eggs really give you more proteins than cooked eggs? Is it safe to drink raw eggs every day? Read more to find out. First of all, there is the danger of salmonella poisoning with eating raw eggs. The salmonella bacteria are found in the egg yolks. However, only 1 in 30,000 eggs will have the bacteria but there is no way to detect which egg that is. Secondly, eggs have other nutrients apart from protein. A particular B complex vitamin, biotin, which is found in eggs, will not be available to the body when eggs are eaten in the raw form. This is because of a protein called avidin which is found in raw eggs. This protein binds with the biotin and prevents it from being absorbed by the body. Not only that, once consumed, it also binds with biotin from other food sources in the stomach and prevents theirs absorption too. Cooking the eggs will disable the binding property of avidin which increases the bio-availability of biotin. Another misconception is that the protein in eggs will be destroyed through the cooking process. However, this is not true. The temperature used to cook eggs is not enough to destroy the proteins in egg. In a study published by the Journal of Nutrition, it is also mentioned that the bio-availability of cooked eggs is 40% more than that of raw eggs! This makes cooked eggs a much better choice! So, stop torturing yourself with those raw eggs and cook them in any tasty form you like it. Your body will absorb it better!